Also serving communities of Skowhegan. There are 5 Assisted Living Facilities in the Waterville area, with 4 in Waterville and 1 nearby. To help you with your search, browse the 9 reviews below for assisted living facilities in Waterville. On average, consumers rate assisted living in Waterville 3.3 out of 5 stars. Better rated regions include Augusta with an average rating of 4.3 out of 5 stars. Caring.com has helped thousands of families find high-quality senior care. To speak with one of our Family Advisors about assisted living options and costs in Waterville, call (855) 863-8283. The aptly named city of Waterville is situated along the Kennebec River and boasts seven structures listed on the National Register of Historic Places. Seniors will find many fun and interesting parts of Waterville to explore including museums, golf courses, and a four season recreation area. There are also 10 assisted living facilities in the Waterville area, with three in Waterville and seven in the neighboring communities of Augusta, Readfield and Hallowell. Assisted living communities help seniors with daily care such as getting dressed and bathing, but not as much help as a nursing home provides. Winters in Waterville are extremely cold, with temperatures in January and February averaging 8 degrees. Summers are more pleasant, with temperatures averaging 80 degrees. The cost of living in the Waterville area is roughly the same as the national average, and it is also 4 percent cheaper than the Maine average, so life in Waterville is affordable for most. Seniors in the Waterville area can enjoy a fantastic array of events courtesy of Waterville Creates!, a local community arts group. With events taking place in locations such as the public library and the opera house, there is something to do for seniors with all interests. The Waterville area is home to world-class medical facilities, including Inland Hospital, in the event of medical emergencies or illness. Waterville is a member of the AARP Network of Age-Friendly Communities, meaning that its elected leadership “has made the commitment to actively work toward making their town, city or county a great place for people of all ages,” according to AARP. Waterville has an array of community resources for seniors, including Spectrum Generations, an organization that focuses on helping seniors live their lives to the fullest by providing them with fitness, fun and friendship, as well as two other senior centers. Assisted Living costs in Waterville start around $0 per month on average, while the nationwide average cost of assisted living is $4,000 per month, according to the latest figures from Genworth’s Cost of Care Survey. It’s important to note that assisted living rates in Waterville and the surrounding suburbs can vary widely based on factors such as location, the level of care needed, apartment size and the types of amenities offered at each community. 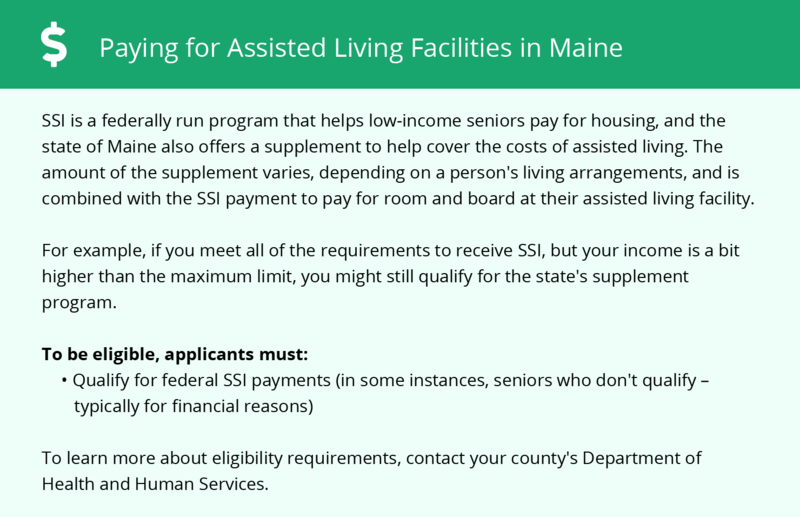 MaineCare helps seniors in Maine to cover the costs of going to the hospital, getting medical supplies and receiving long-term care in an assisted living facility. 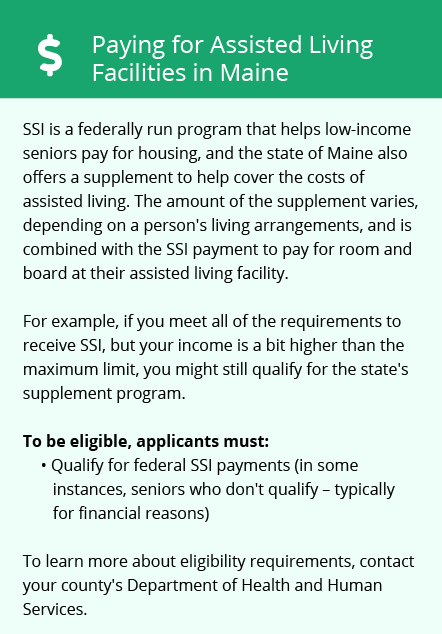 Maine also offers Medicare programs to eligible seniors to help subsidize costs of care. Waterville and the surrounding area are home to numerous government agencies and non-profit organizations offering help for seniors searching for or currently residing in an assisted living community. These organizations can also provide assistance in a number of other eldercare services such as geriatric care management, elder law advice, estate planning, finding home care and health and wellness programs. To see a list of free assisted living resources in Waterville, please visit our Assisted Living in Maine page. Waterville-area assisted living communities must adhere to the comprehensive set of state laws and regulations that all assisted living communities in Maine are required to follow. Visit our Assisted Living in Maine page for more information about these laws.